The third heavy weight castle faction to grace our shelves came in the form of the mighty Black Knights; distinguished by their symbol, a blue Wyvern Dragon and a love of Black in all their structures. Sadly due to the fact that the symbol on their shield was repeated by the Dragon Masters (albeit changed in colour) and that their torso printing had been used before. This faction is often overlooked or misunderstood; many see them as early Dragon Masters or late Crusaders, they are however a faction all to themselves, it’s just a shame they never received an original torso printing to call their own. These guys hit the ground running fortified, by the excellent Black Monarch Castle (6085) in 1988, this set gave them the initial strength to take on the more established (and older) Crusaders and Falcon’s. They were noted to be on very good terms with the Crusaders; however they had a number of conflicts with the Falcon’s, indeed the final appearances made by the Falcon’s were as the aggressors in a number of Black Knights sets. They were also noted to have the finest fleet ever, in the form of the Sea Serpent, Black Knights Boat and the Battle Dragon (until the Trolls and Skeletons came along and outshone them in the castle sets of 2007). 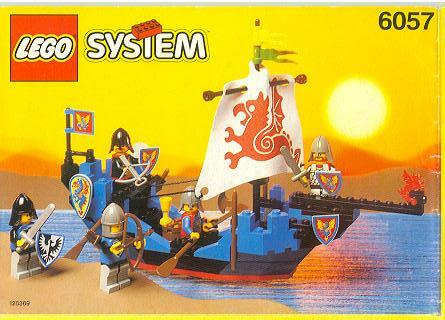 This greatness of sea warfare was sadly the only true strength for the Black Knights as they had no large siege engines, carriages or infantry battle packs of any worth. 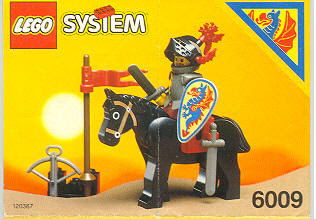 The Black Knights faction also featured a number of advancements never seen before. They were the first major faction to place facial hair upon their warriors, they were the first faction to receive oval shields and they were the first faction to have the dragon plume. They also saw advancement in horse armour, theirs were the first sets to feature Barding and they changed the standard horse saddle from having only one clip to two (1992 was the year LEGO implemented that particular change). In 1990 LEGO released the chest plate, ghost, falcon (the grey bird) and the new styled helm; in this set we see them all. 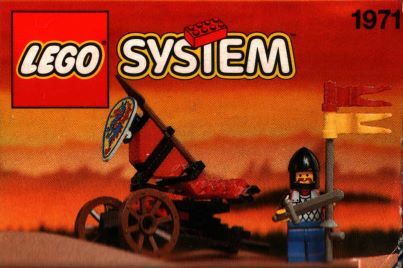 It is a beautiful microcosm of all that was new and exciting at the time, I never get bored of these style minifigs and the fact that it comes on a horse is a brilliant heavy cavalry army builder, five or six of these and you truly have a brilliant foundation for a mighty army. The structure itself is very simple but it includes doors (which were also new) and the pin technique so that it can be connected to a castle, (so it has some useful parts for Moc’ing). 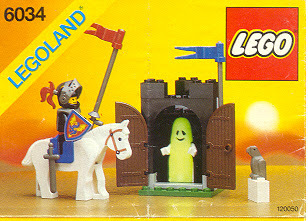 I however would have changed the ghost for a minifigs so that you could image it to be a small outpost; that way the ghost would also be seen as a rarer fig and something to be coveted when found it larger sets, as it is the Ghost fig was almost too common in sets of this era (the glow in the dark plastic used for the ghost is now no longer used by TLC, so in some sense the figs are rarer now). This set was already reviewed in my Falcon’s article, however I feel that it still deserves to be seen here as I truly believe that the figs are Black Knights, still I have no idea why the shield is included in this set. Overall it’s rather bizarre; however I like the boat design. 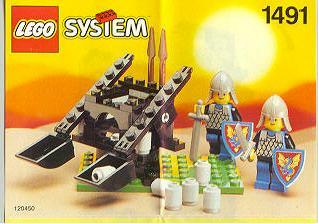 This little set is the strongest of the Black Knight’s siege equipment, a small twin armed catapult that sadly cannot be moved, it does however rotate and is equipped with a fair supply of stones, so at least it has some strengths. 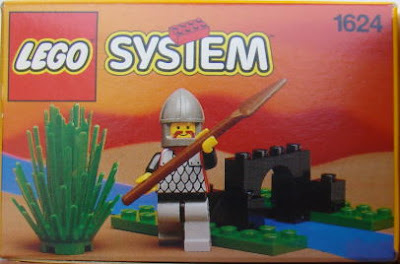 It also comes with two minifigs and a fair supply of equipment and a nice green base (rather large for a set so small) so as an army builder it’s an ok set. The biggest flaws I have with it is the fact that we have seen a better version of this with the Crusaders (Twin Arm Launcher 6039) and that the fully blue knights further confuse the general design of the Black Knights army (I think I added these two to my Falcon army and used them as artillery men for 6030), on the battle field the Black Knights sadly were the least uniform of all the Factions and I feel like that is a shame (though possibly most historically accurate). I hate to see a set de-evolve as the years progress sets should get better; this set is less exciting than the Crusaders one from 1988, not a good thing. 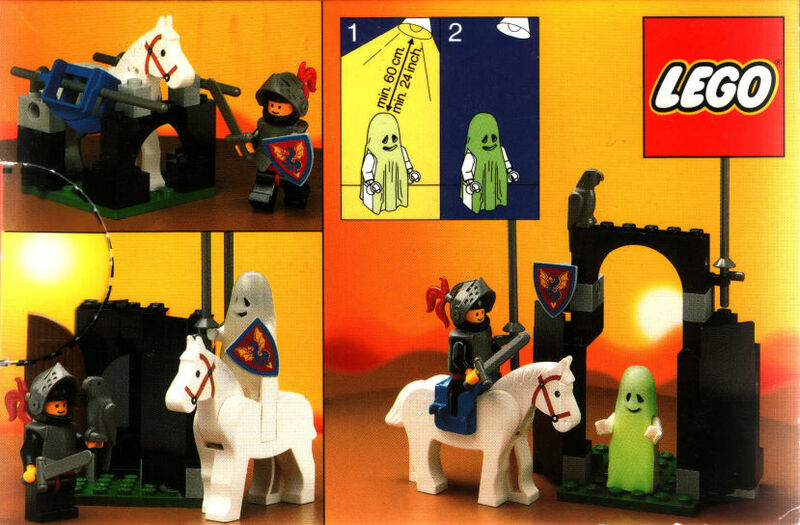 Another small set and another ghost, I like the inclusion of the ladder and small printed flag in this set, but I always felt like the soldier looked like a Crusader who had darkened his helm (I had this feeling a lot with Black Knight sets). 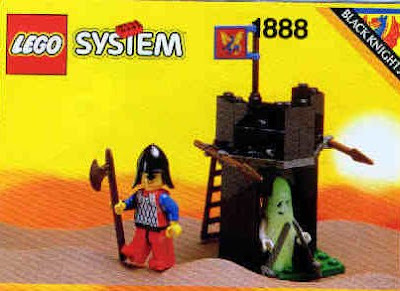 This set was part of a value pack (1891) which included a space, pirate and town set, so I guess the idea of this value pack was to show off the castle series, I like the fact that despite only containing two minifigs you receive five weapons but as a set it does nothing overly special. 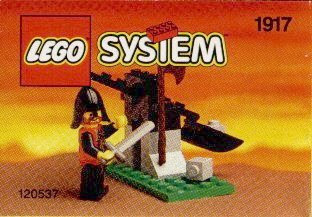 I love the fact that LEGO had to show how creative you could be with sets; looking at the back of the box you can see that their design ideas for this set were rather limited. That being said, this set is brilliant, we have here possibly the most over armed knight in LEGO history, crossbow, lance, shield and two swords (why two? ), he has enough weaponry to equip three more men! I love the armour and the oval shield, and an extra horse is always welcome. This set, 6034 and the fact that both Black Knight castles came with four horsemen are all reasons as to why so many collectors have cavalry armies for their Black Knights, LEGO made it so easy; it should also be noted that the printed face added some much needed variation for any collection at the time. This is one of my favourite little sets for the Black Knights. Another set and another value pack (including 1624 and 1596), luckily this was an all castle value pack (1597)so that it actually made it very worthwhile to pick up, sadly it was only available in the US and Canada so us European types missed out. I like this more than the Battle Dragon, because it makes more sense with two warriors clearly on the same side, a decent number of weaponry (including the oval shield), a dragon plume and printed faces; it’s simply a superior set. 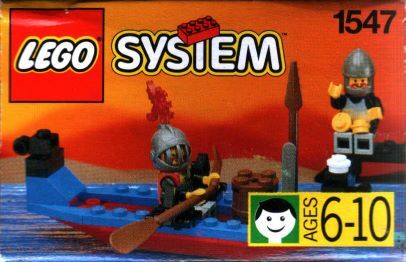 However I prefer the Battle Dragons boat as it has a nice second level to it (where you can put the leader) and the Dragon face on the front looks less comical than this one, swap the minifigs and we would have the perfect small boat set; as it is both are lacking somewhat. This was the also included in the all castle value pack (1597) and I really like it, you get a printed archery target, a shrub and a reasonably well equipped minifigs. A nice compact set, have a couple of these in your castle courtyard and your really onto something; shame it was only available in the US. 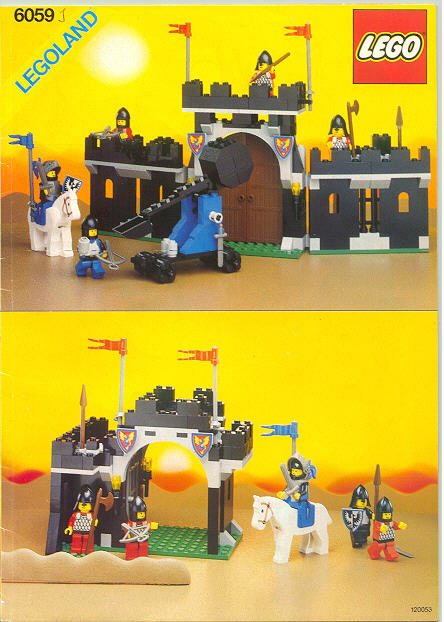 This is a rather odd set, it was released in 1993 and then again in 1998 as part of a promotion for a Japanese candy company (at which point any other Black Knight sets had long since disappeared). We see here a sparse catapult that cannot be moved or turned, so from a effectiveness viewpoint it is rather useless (unless attached to a tower on a castle). It was only available in the US, but it’s not the best set so I don't feel anyone is missing out, but I do appreciate the square bricks as ammo (I feel they looked better). This set was part of a five piece value pack only available in the US, so sadly I never owned it; however it is very easy to recreate using the bricks I have in my collection. I like the fact that it can stand on its own and the little shield at the front to protect the man pushing it is rather cool. I do feel that it is a little too small to cause any major problems to some of the larger castle gates, but it’s still a neat little set, the oval shield is very welcome. I love this set, it’s so fun and still unique for today, the Trolls have a huge ship and the Skeletons have a medium sized one (both of which I still like) but the Black Knights have the only small ship and for a good fifteen years they were the ones in charge. 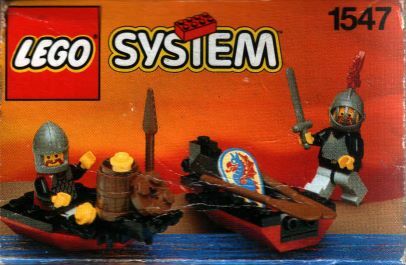 Strong pros for this set are the sail cloth with a brilliant printed emblem, the solid design to the hull and the very fair number of figs and equipment (it has seven shields in this set). This set is the reason why the Black Knights were seen as the master of the waves (chainmail and plate mail armour on a ship seems a tad foolish to me though). This set is also very special as we see the last stand of the Black Falcon’s. 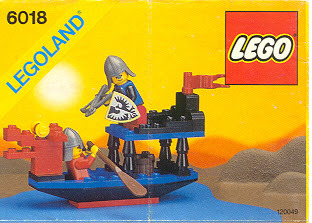 My biggest problem I have with this ship is the fact that the soldier armed with the crossbow has no quiver (one shot is all he gets) and that LEGO never made any sets similar; this set is so nice but never had anyone to fight against and as such it became a bit redundant for castle fans. 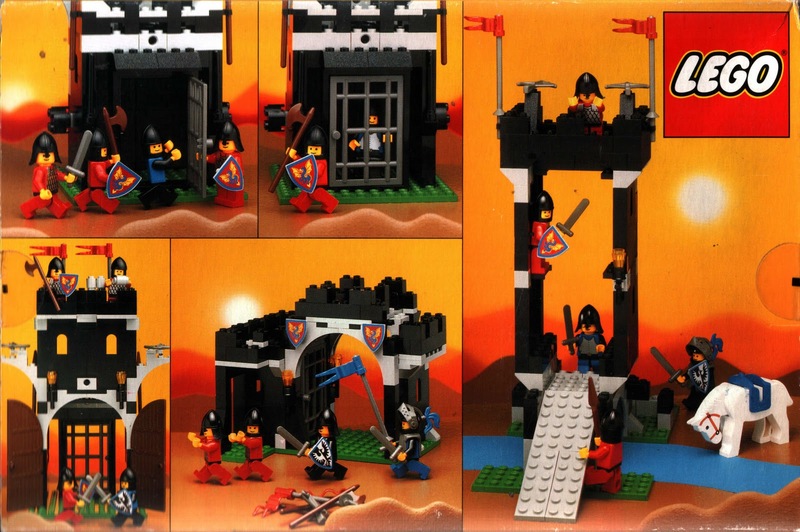 This set shows the final resistance of the Black Falcon’s, I almost want them to conquer the stronghold so that they have somewhere to stay (as in 1990 they had no more sets of their own for the last few years). 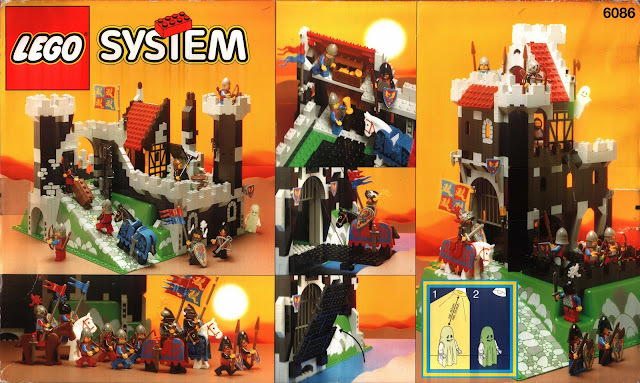 This set is all good, the catapult is interesting, the castle to well built, hinged and contains a jail, the numbers of figures are good and we even get a horse. It was designed to be attached to Black Monarchs Castle, which gives this set even more strength, my only criticisms for the set are the lack of quiver (again) for the crossbow and the ‘all red’ look on the Black Knights is very unappealing. 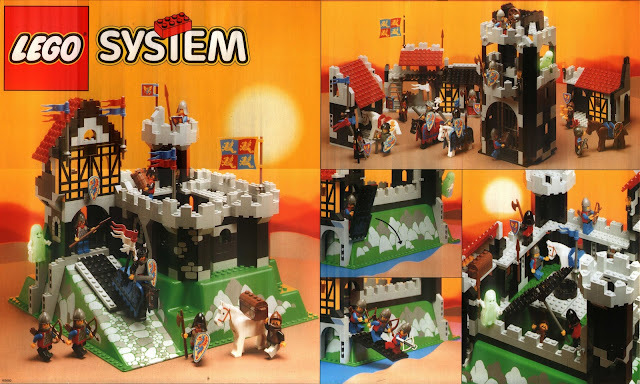 It is a great ‘all in one’ play set, with everything you need to start loving Lego castle. This set is ironically the first for the Black Knights and also the first to feature barding, so I guess you could say that the Black Knights entered with their best foot forward. It is a brilliant initial set and the castle itself is quite an improvement on the earlier ones. The front gate is very imposing (I love the portcullis) and the design for the winch is a clear advancement in LEGO technology, the sloping columns in between the wall panels give the castle a very solid design and the black brick choice gives the set a clear individualism over what came before. New to this set we see barding for the horses (I mentioned that above), black knight shields (10 in total), black knight flag, inversed printing on the wall and corner panels (it was grey with black printing, it became black with grey printing for this set) and the jail cell LEGO piece. At twelve figs and four horses this set is very generous on extras and the fact that the castle can be opened (similar to the previous castles) gives a lot of added play value to this set, the castle does not come with any opposition however so it is following the trend of all the others, somewhat to the detriment of playability. 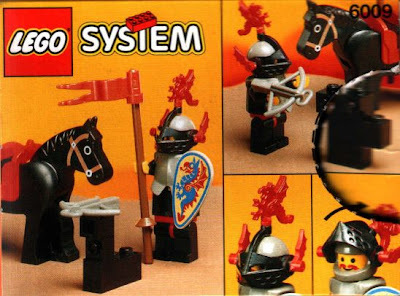 As this set was released in 1988 we miss out on some of the newer LEGO pieces that made Black Knights so interesting (such as printed faces, oval shields, armour plating, ghosts, visor styled helms) however I don’t think the set suffers for it, this set is a brilliant evolutionary piece (the missing link if you will) from what was, to what was going to be, it has roots in the past but its intentions in the future, a modern style filled with dated figs. It is possibly the last of the traditional castles and possibly one of the best, after this set most castles could not longer be opened or connected, the beautiful connectivity of LEGO sets (as mentioned at the end of my Black Falcon article)was disappearing to be replaced with something else, raised baseplates and closed castle design. It was simply change, neither a good or bad thing, however this open design was to eventually return to LEGO castle sets we just had to wait almost twenty years. This castle is debatably the finest ever realised by LEGO, even though the raised plate is disapproved by some, it is still one of the most interesting, largest and coolest looking castles around. Let’s add up the points on this set. Point 1 the style: The nice mix of black and grey bricks keeps the castle looking good without over doing it; the flashes of red roof and yellowed wall panel add a nice variation to the colour scheme as does the green from the baseplate itself. Point two the extras: The huge number of extra items add some great play value to the set, we see twelve figs, all of a good variety (a Wolfpack and a ghost), four horses, multiple weapons, two types of shield, barding, armour, visor styled helms, cloaks, a chest, a barrel, a ladder, multiple lanterns, a goblet, multiple flags, the new single mould portcullis, multiple dragon plumes and the unique white dragon plume, and the unique large dragon flag (that’s a long list). Point three the play value: The extra hidden play value to the set adds a lot, we have a drawbridge and portcullis, a hidden exit, a ghost’s tower, a well and underground prison as well as the home styled yellowed structure on the side of the castle, there’s just a lot to do. I think this is one of the best castles TLG has ever produced, the design is just incredible and it makes the set look so unique. There are plenty of minifigs with it but every fig is also different (even if it’s just in some minor way), you also receive lots of accessories, rare pieces and great playability, this set is as close to perfect as LEGO could get, it’s a shame they took this brilliant raised plate idea and used it so poorly in future sets (which will be explored in future articles), it’s clear LEGO knew what they were doing, yet chose not to repeat the perfect formula. On an interesting side note this set was originally called Dungeon Master's Castle, so it is possible that these more modern knights could have been a splinter group from the original (the Black Knights splintered to become Dungeon Masters); however this is just speculation and the name was changed rather quickly, still it’s interesting to see how LEGO evolves (first a Dungeon Masters set and then in the following year a Dragon Masters Faction). It was hard for this faction to make a real impression on the psyche of the very young and impressionable youth that was yours truly back in the early 90’s. I remember I liked both the castles (a lot) but the faction itself never really felt like they had an identity to me. I could always see the Crusaders ruling the land and governing the peasants, I could see the Falcon’s marching to war determined to capture the larger Crusaders fortresses and I could see the Forestmen swinging through the tree and carrying gold off into the night, but I never saw were Black Knights fitted into all this. I remember I made them mercenaries for a while, then I made them evil, then I made them allies to the Crusaders, they fitted a role as and when I needed it rather than being suited to a specific style, I always had a problem with what to do with them. 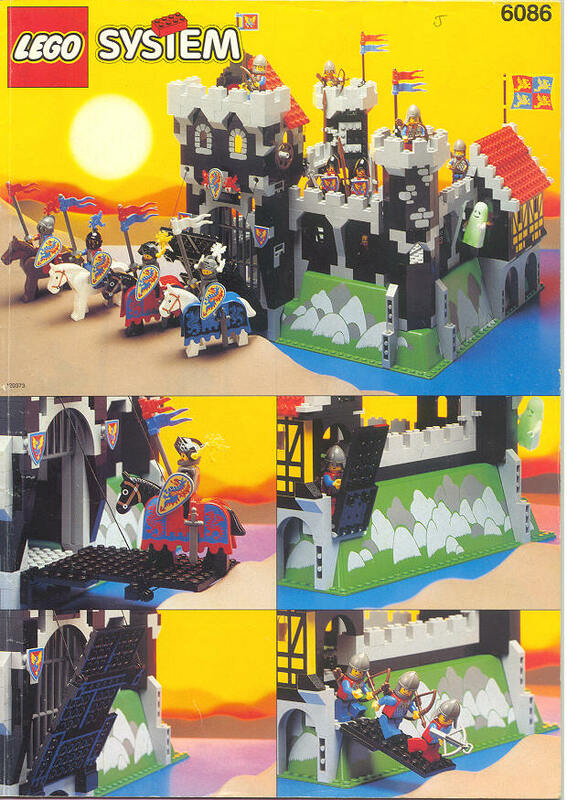 Finally when Dragon Masters came out I simply used all my Black Knights as extra warriors for them and because the castles available for the Dragon Masters were rubbish (in the humble opinion of the eight year old child I was) I used the above castles as their main stomping ground. As the years progressed I forgot entirely that the Black Knights were a faction unto themselves and had nothing to do with what came after. This could be completely unique to me but during my dark ages I could recall every faction from the 80s and 90s except for the Black Knights, I feel like that is a shame as they are a great faction and deserved better than to be forgotten by yours truly. I guess this article is a way of apologising to them for that. I do agree the Black Knights lack an identity, which is a reason why I will always ensure that each of my black knights will have the triangular shield to represent their faction in my collection. Having a crest on their torso would really be a good idea and will save me lots of money on the black knights shields for my troops (less archers). Cheers for the comment, it is really nice to get good feedback. Childhood memories are the main reason why I do most of the work for this blog. I was a little worried about mentioning the lack of identity with the Black Knights, as they are a great faction and some people hate to hear anything negative about their fav sets. But its true this faction has a real identity crisis with its troops. I love your dedication to give everyone a shield, I wish I had done the same. Next up is Wolfpack, so hopefully they will be as interesting. It seems we're pretty near the same age, and I can assure you I had exactly the same play and thought experience as you mention at the end of this black knights review. You know I was really expecting your publication of articles, is enjoyable to read. Really enjoyed your reveiw. It is very entertaining looking forward to your new post. One request would be great if you could reveiw themed sets in relation to old sets like this. I really appreciate this but can you please do also reviews on Lego Knights Kingdom it was my most favorite sets from 2006, if you need my help you got it! I also have many dragon knights. Normally I get a look at all the sets (physically) so that I can be honest with what I see, for the sets I can't get a hold of I build them using instructions from peeron, it’s not as accurate (as I have to sub the occasional colour) but it’s better than pictures of the net. I appreciate the offer for help but I am ok. Your presentation of Castle series is very good. I agree 6086 is the best castle I ever see. For a new job I recently moved back to the same city I grew up in (where my parents still have the same house) and found myself pulling out all those old castle sets and eventually not being able to help it but buying a few of those childhood dream sets on ebay just you like you did. lol to your wolfguy comment and I completely relate to that as well. Luckily I at least had two from their carriage set. Thanks alot for the comment John. 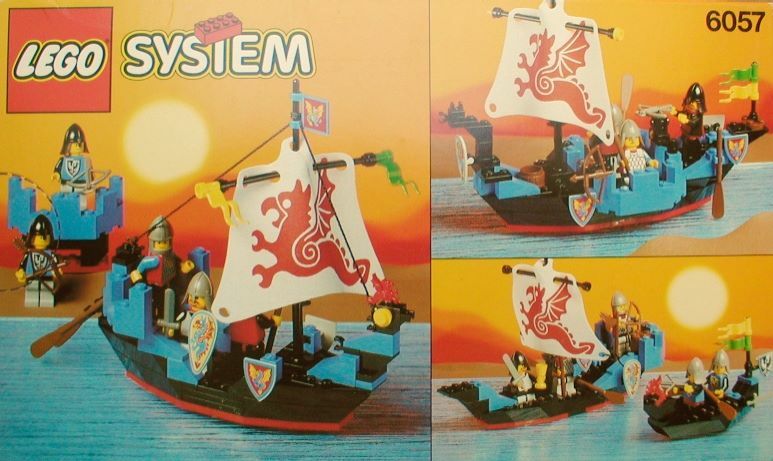 I understand what you mean about the joy of opening your old sets up and rebuilding them, recently I got my last LEGO box from my mums attic and inside was Fort Legoredo, I had forgotten I had that one and then all the memories came back in one go (such happiness). Winning both the Fire Breathing Fortress and Dark Dragon's Den is really lucky, you will love them both. If your new shopping for LEGO take a look at this site, as it will contain most sets from your childhood at a reasonable price. Thanks for the wonderful comments and letting me into your LEGO world, its part of the reasonn why I made this site. 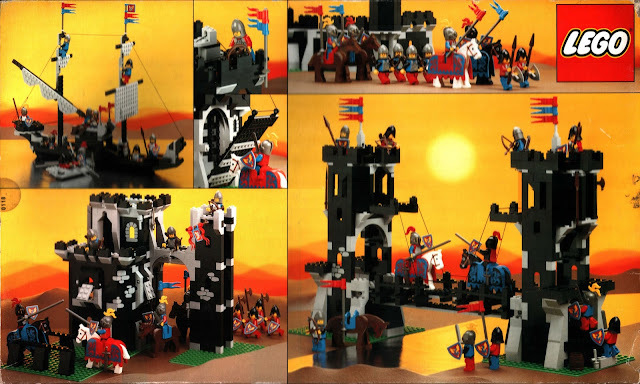 The Black Knights were actually my favourite faction by far, and for me '92 was the zenith of Lego castle with 4 realistic factions available. 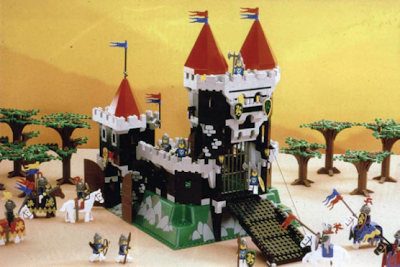 The Dragon Masters were the start of fantasy (dragons etc) and whilst I did get the majority of those sets, looking back it upset the balance of what had been a fairly realistic kingdom for me up until '92. The Black Knights castle is surely the best castle structure lego ever produced - it had everything except large doors, which I would always like to have seen (with maybe the Portcullis set towards the back of the gatehouse - more realistic!). On your point about uniforms, I was never too concerned about armies looking "uniform". In those days, armies were raised by powerful nobility/knights and could be a fairly medley bunch of mercenaries. I therefore think mixes of chain mail, slate armour and heraldic symbols was probably correct. What annoyed me more was when they got things clearly wrong, like including a dragon master knight in the Royal Knight's bridge but with a Black Knight's shield; and also calling some figures with Dragon Master torsos Black Knights. That was always really jarring for me! Dragon masters is (I think) one of my favorite themes... (dark forest is another one.) I think it boils down to the fact tht I love the dragon master soldiers and the color scheme. The dragon is neat, too, and I always thought this was my perfect balance of fantasy and normality, that is, not having too many weird or strange things around like faeries, life-giving pools, d&d stuff, etc. etc. There is mostly just ghosts, wizards, dragons, magic, and strangely different cultures. When I got my first and only castle which is the 6085 Black Monarch's castle, I never thought about who's good or evil when I was a kid, I remember that I loved the back towers of this castle and wanted the castle walls panels, it had 12 minifiguers, 4 horses and a lot of weapons and shields, what a boy could want more, now that I am an adult and started learning about the history of the Lego history, I keep falling in love with the Black Knights, in a matter of fact I feel they got the best castle structures, whether it is folding or built on a mountain, even the smaller sets like the small boats and Sea Serpent, they are all great and unique, from head to toe. 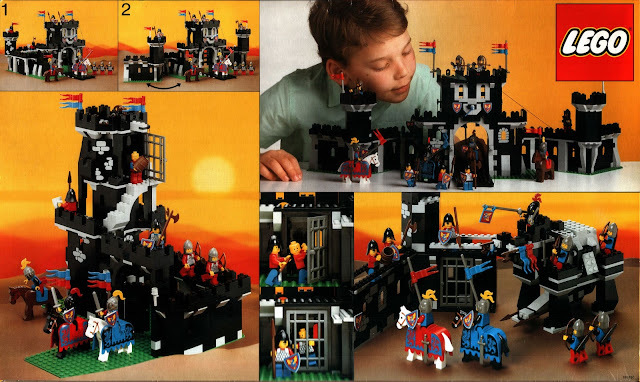 Black Monarch's Ghost 6034 was my very first Lego set. I thought the visor on the helmet was the coolest thing ever. 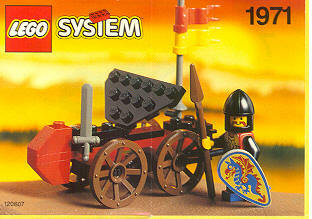 I also got the Dual Defender 1491 set. 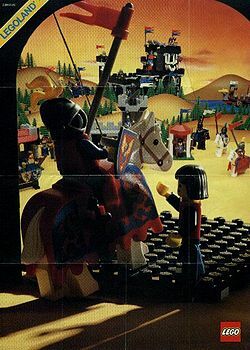 The Lego Knights were my favorites, but I bounced around from so many different types of toys back then that I didn't stick with them very long. Even with other Lego's I ended up with an assortment of all the different types of sets: pirates, space, etc. You can make pirates and knights work together, but the space guys just don't fit in very well. I wish I'd got more of the knight sets though. Even though they were my favorite, I somehow ended up with more pirate and space sets. It doesn't make sense. U can swim in mail armor, so no problem if u drop from the ship, u won't drown, u can find test videos, from relevant people with real riveted mail (about Sea Serpent, that look foolish to be in mail on the ship). Nice blog, i think i read all over again about castle, every year or so. 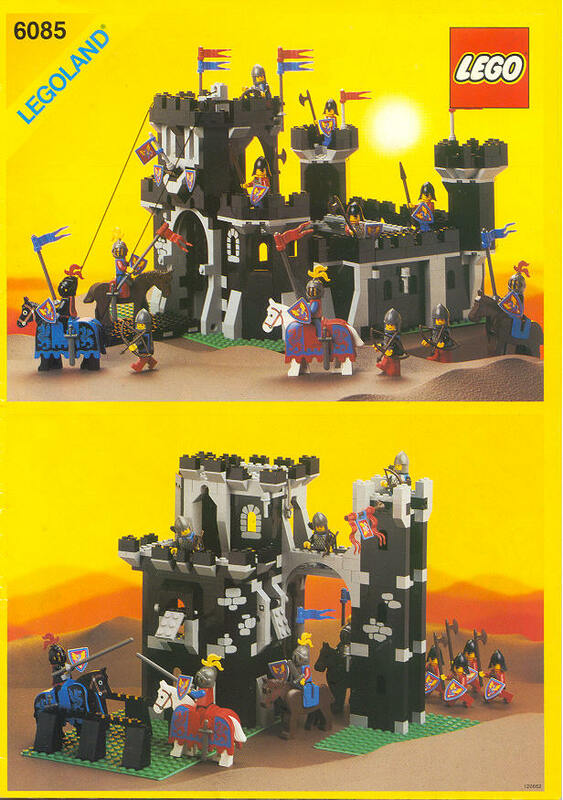 Now that I'm looking into the castle theme again, what I notice is the large amount of small sets exclusive to the US. That seems unique to this faction. These sets also look a lot more cartoonish to me than the regular sets, they're almost a sign of things to come with the later fantasy factions. They just seem more....thrown together on a whim. Another thing I notice is that the modular castle system doesn't work as well when they mix up the flat baseplates, and structures like the stronghold built on regular plates. 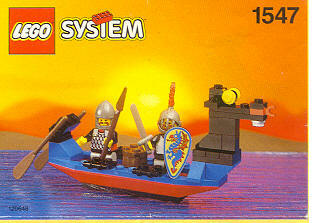 It's really the only thing holding back the modular system, the same goes for the crusaders! My name is Steve I like Lego. One day I will own a monkey.